HomeDecember 4, 2015 – Fight. 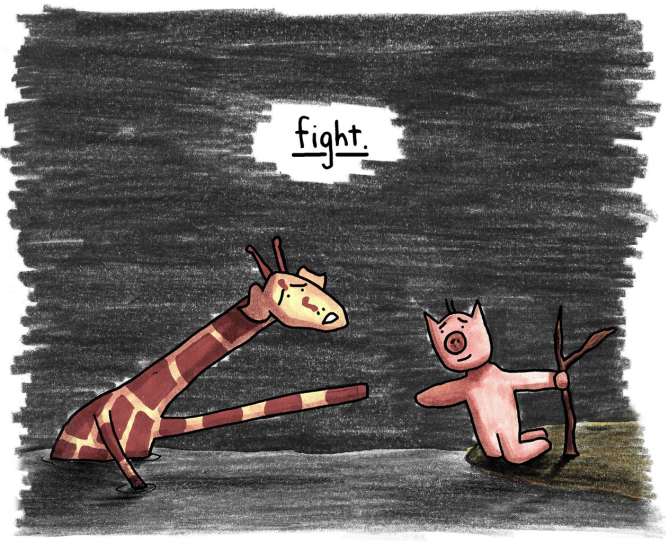 December 4, 2015 – Fight. Like a lot of people…my mind is perpetually telling me to give up. I don’t know why. They say brain chemistry but who knows. Another part of my mind…a tiny, quiet, whispering part. Urges me to fight. I don’t know why that happens either. But that’s it. One more day. One more hour. We’re still here. That’s what matters today. You must have a great guardian angel or muse that keeps you creating these giraffe pieces. Otherwise, I could understand you feeling like giving up. Your tiny light is strong, giraffe-hopper, giraffe-san. Remember there’s always tomorrow and a new day, a new possibility. There’s always a sun in the sky. Sometimes it’s overcast or even black with storm clouds, but the sun is always there. Just because you can’t see it, doesn’t mean to say its gone away. When your feeling low, remeber the the things that made you feel high and smile. Thanks. Need this at the moment.